Access to transporta tion is one of the top concerns for Wisconsinites with disabilities. 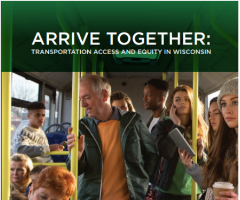 A recent report, Arrive Together shows how people’s needs are not being met by Wisconsin’s transportation system. The report examines the effectiveness of public transit access to major employers and other areas of interest in nine cities and regions across Wisconsin. It highlights stories from transit riders, opportunities for improvement within transit systems, and the serious barriers and needs for improvement at the state level. You can read the report, the summary, press release, and individual fact sheets for the nine cities on the Sierra Club’s website.